The Rotary Club of Crowborough has purchased two Shelterboxes, at a cost of nearly £1400.00, which have been airlifted out to help stricken families in their devastated country. The scheme, initiated by Rotary, involves the provision of a large box which contains a disaster relief tent for a whole family, together with thermal blankets, ground sheets, water storage and purification equipment, cooking utensils, tool kit and mosquito nets etc. The provision of these boxes was made possible by the donations collected by the Club from the generous people of Crowborough. The Crowborough Rotary Club has been part of our community since it was founded in 1953, and has been serving good and needy causes both locally and internationally since then. The Club is part of a large international service organisation of some 1.2 million men and women Rotarians in 32,000 Rotary Clubs in 167 different countries throughout the world, who all have a common aim: a wish to give service and help to needy individuals and groups in our society. 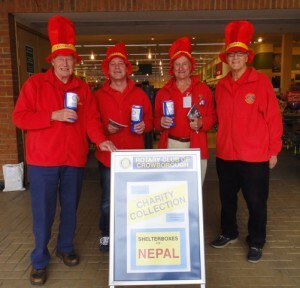 Many local people will be familiar with some of the causes helped by the fundraising efforts of the Crowborough Rotary Club: Kent, Surrey and Sussex Air Ambulance, Crowborough Community First Responders, Hospice in the Weald, and innumerable smaller organisations and individuals in need of assistance. The Club takes part in various local activities. Apart from the fellowship events within the club, the club has provided days out for the Friends of Chernobyl’s Children, an annual Kid’s Day Out for underprivileged children, a Senior Citizen’s Party, and sponsorship for the Beacon Academy’s Art Show and Young Musician of the Year Competitions, in addition to the Rotary District’s Young Chef and Young Musician’s competitions. The Club may also be seen taking part in the Crowborough and Rotherfield Carnival processions. At international level, Rotary has been responsible for organising the Polio Plus programme, to rid the world of the scourge of polio. Now reaching its final stages, success is just a small step away. There are only three small pockets left, in countries where conflict zones are preventing access. The Club holds a friendly fortnightly meeting for dinner at 7.00pm, on the first, third and fifth Monday of the month at Barnsgate Manor, Heron’s Ghyll, Nr. Uckfield. The meeting involves fellowship and discussions, often with an entertaining guest speaker. There is also a lively social programme for members.